Demand for electric cars remains steady, even in the face of slightly lower gas prices. That’s the view put forward by Nissan. The automaker says it is seeing unrelenting demand for its limited-production Leaf electric vehicle continuing for the foreseeable future, in spite of rumors that consumer fascination with battery-powered cars is waning. Through Oct. 31, Nissan sold 8,048 of its electric cars, giving the companies a bit of insight into the car’s appeal to customers. 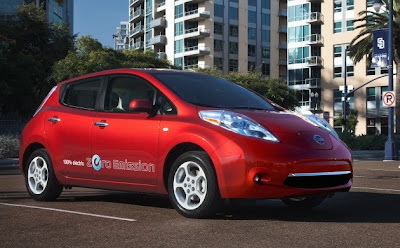 Thanks to data from the Leaf’s OnStar-like telematics system, owner surveys and direct discussions with enthusiastic owners, Nissan has learned that the little battery-powered Leaf is shouldering most of the transportation chores for its owners. Brendan Jones, director of electric vehicle marketing and sales strategy at Nissan, reports that owners say that the car they bought as a second car is actually being used by drivers as their family’s number one vehicle. “They drive it primarily because it is fun to drive,” he said, but of course they wouldn’t have that option if the car’s driving range proved to be too short for practical use. It turns out that owners drive about 35 miles a day, the same distance as most surveys of American drivers report as the average distance for U.S. drivers. But drivers often overestimate their own daily mileage, and this makes them wary of a car that has a cold-weather driving range of as little as 65 miles. The “range anxiety” of being stranded with a dead battery is overblown, asserted Jones. Nissan Leaf drivers are typically making three trips between recharges, so they aren’t usually in the situation of having to make a beeline directly from one plug to the next for fear of being stranded. However, Nissan is also reducing the impact of actually getting stranded, so that it won’t be the ordeal it is today, when the car has to be towed in from the road. Nissan provides Leaf owners with free roadside assistance, and the company is adding mobile quick chargers to the response trucks, so that they can provide the equivalent of a can of gas to get a Leaf with a dead battery pack back on the road. Customers have embraced the optional fast-charging port, which enables specialized commercial-grade chargers to quick-charge the Leaf to 80 percent capacity in just 30 minutes. Enough customers were choosing that $700 option, despite a current shortage of suitable charging stations, that Nissan decided to make the quick-charging port standard equipment on the $940 uplevel SL trim package, Jones reported. There are currently 562 such quick chargers being installed nationwide, he added. Nissan is continuing its nationwide rollout of Leaf availability, and the company anticipated delivering another 10,000 of the cars to consumers in 2012. Once Nissan’s Leaf battery plant opens in Smyrna, Tenn., the company will have the capacity to deliver 150,000 Leafs per year. But Jones says that Nissan is not concerned about potential difficulty finding that many customers for battery cars. “The competition isn’t pulling out of the [electric vehicle] market,” he pointed out. “The competition is coming into the market.” That demonstrates industry-wide confidence that customers will embrace electric cars, he added. One interesting purchasing characteristic of Leaf drivers is that a surprising number of them are choosing to buy their cars outright. Nissan had predicted that most buyers would lease their Leaf as a way to make its acquisition more affordable, and as a hedge against concerns about battery longevity and the possibility of a pricey battery replacement in the future. But instead, the majority of Leaf customers bought their cars, most of them either paying cash or paying for the car with outside financing. Jones hypothesized that perhaps some EV enthusiasts were worried about General Motors’ decision to withdraw its EV1 electric car fleet at the end of the cars’ leases, so they bought them outright to ensure they could keep the cars. Today 40 percent of Leaf customers are buying the cars with cash or outside financing. But Nissan expects as the Leaf pushes into the Northeastern states, that customers there who are more familiar with leasing luxury cars will be more prone to leasing their Leafs. Or maybe they just aren’t worried anymore about their cars going to the crusher when the lease is up.